Good Neighbors was founded in 1991 with the mission to support disadvantaged children in Seoul, Korea. The beginnings of Good Neighbors were rooted in projects such as handicapped children’s programs, orphanages, finding homes for poverty-stricken widows, rural community development, and assisting families of tuberculosis patients. Currently, Good Neighbors International conducts missions around the world to improve the quality of life and educational standards, as well as to provide aid in areas of civil unrest or natural disasters. Good Neighbors started its first overseas development project in Bangladesh in 1992 followed by refugee support in Somalia in 1993. Good Neighbors was the first NGO in Korean history to dispatch a medical volunteer relief team to Goma Refugee camp in Zaire (now the Democratic Republic of Congo) in response to the Rwanda Genocide in 1994. 5 years into its establishment, Good Neighbors was recognized as a global civil society actor, obtaining the General Consultative Status with the UN Economic and Social Council in 1996. In 2007, it was awarded the Millennium Development Goal Award for its achievements in promoting universal primary education worldwide. Good Neighbors further extended its global development operations working side by side with other renowned international NGOs on the world stage. In 2011, it became the first Korean implementing partner of the United Nations World Food Program (WFP) and is further expanding its global network with international organizations for bringing ‘good changes’ worldwide. Good Neighbors is known as Good Neighbors International Nepal in Nepal. 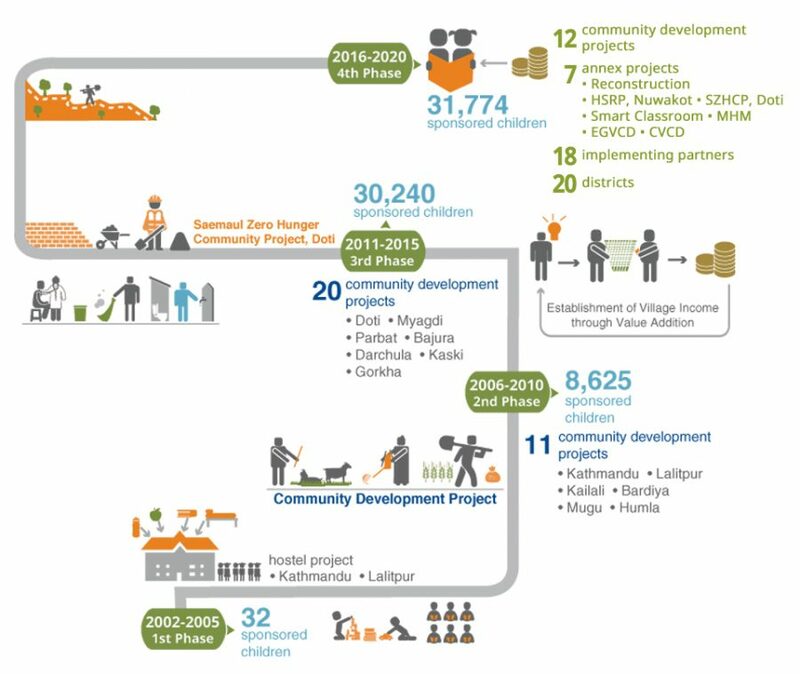 GNI has been working in Nepal since 2002 with the objective of improving lives of poor people, especially children through education, income generating activities, health services, child protection, disaster risk reduction, advocacy and network building. Currently, GNI Nepal has been operating its activities in 20 districts. GNI Nepal signed the Fourth Project Agreement (2016-2020) with the Social Welfare Council for five years (2016 – 2020). Major thematic areas are Education, Livelihood Enhancement, Health and WASH as well as Sponsorship Service and Child Protection. Advocacy, community partnership and network building, disaster risk reduction and gender are cross-cutting issues.